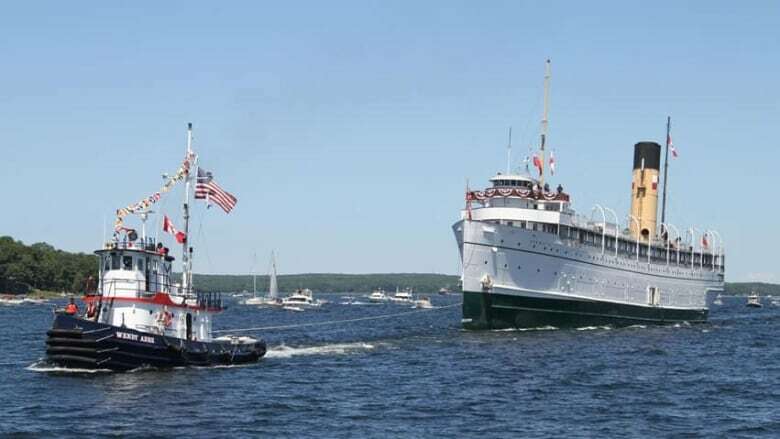 The small community of Port McNicoll, Ont., on Georgian Bay welcomed an old friend on Saturday, as the SS Keewatin, said to be the oldest remaining passenger ship from the Edwardian era, was tugged into harbour. The Keewatin was built for Canadian Pacific Railway as part of a fleet used to transport passengers from Port McNicoll, near Midland, to Thunder Bay on Lake Superior, where they could reconnect with trains heading to Western Canada. Accompanied by an armada of several hundred boats and given a 21-gun salute, the vessel was towed into port Saturday afternoon, 46 years after leaving Port McNicoll upon its retirement. About a thousand people, including dancers, were on hand on the shores of the bay to mark the festivities. The Keewatin is older than the Titanic, and transported passengers on the Great Lakes for nearly 60 years. After it was taken out of service, it spent the last four and a half decades as a floating museum on Kalamazoo Lake in Michigan. A Canadian investment company bought the 107-metre-long ship and plans to turn it into a restaurant, museum, theatre and event space moored on Port McNicoll's waterfront as part of a huge redevelopment of the town.